For some of us at Cool Places (the more active ones, at any rate), the Easter break is our first chance for a full four days of surfing under blue sunny skies (well, we live in hope). But even if the waves are only so-so this weekend, there’s a reason to head to Croyde in North Devon, because Friday marks the opening of Britain’s first museum devoted to surfing – the brand-new Museum of British Surfing, which opens on April 6. Pictured above are the inaugural poster of the Museum, and a book cover 1934 - The Art of Surf Riding. It couldn’t be in a more appropriate place: for many (at least those who don’t get as far as Cornwall), Croyde is the home of UK surfing: in the 1920s locals rode the breakers on wooden planks – known as coffin lids – and the surf beaches of Saunton, Croyde, Putsborough and Woolacombe have been a hub for the fledgling UK surf industry since the late 1960s. Now, after almost a decade as a touring project, run by local surfers, the museum of surfing has put down roots in Braunton, confirming this fabulous corner of the country as a wellspring of British wave-riding. 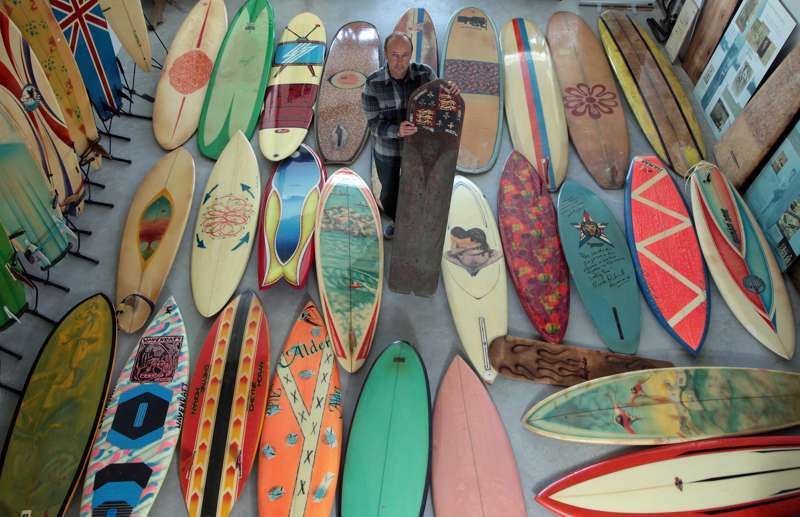 Museum founder Pete Robinson tells us most of the museum will be dedicated to an annual exhibition to explore themes of British surf culture – past, present and future – kicking off with the ‘Art of Surfing’ to get the whole thing going. Expect sketches of Hawaiian surfers drawn by sailors of Captain Cook’s expeditions and 1920s travel adverts of beaming belles on their boards as well as airbrushed surf art on early boards. There’s even a photo of south Devonian Agatha Christie with a board at Waikiki, where the author became one of the first Britons ever to master stand-up surfing. Agatha Christie a surf chick? Sometimes life really is stranger (and, well, cooler) than fiction!